Today I would like to demonstrate how to assemble a simple layer cake, the banana blitz (or nannersplosion, please feel free to comment and let me know which name you like better), from start to finish. To begin, the cake layers should have been baked, cooled, then wrapped in plastic wrap and frozen overnight. Bring them to room temperature to thaw for 1 hour before assembly. Also, put previously-made buttercream and ganache on the counter at room temperature for an hour as well. Grab an appropriately sized cake board (at least 1" larger in diameter than your cake), place a small smear of buttercream on the middle of the board to keep it from sliding. Unwrap one of your cake layers and place it top-side down on the middle of the cake board. If you left your parchment on the cake when it cooled (a good idea), you can place your hand here to steady the cake as you cut it in half. 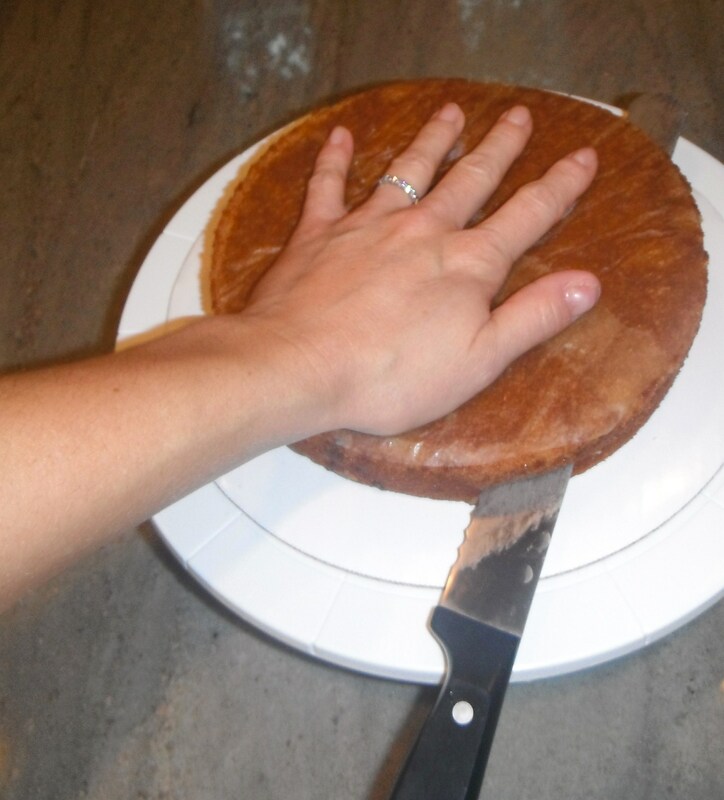 Use a long, sharp, serrated knife (at least a couple inches longer than the cake) and start slicing through on one side in the center of the layer. If you watch the other end of your knife while you are moving the cake around, you will see that the knife continues to follow the path you originally cut. This helps to keep the layers even. Once the cake is cut in layers, remove the top half and set it aside. Now, you can begin putting in your fillings. It's usually a good idea to put fillings in a decorating bag so you can squirt it evenly in a circle around the layer. Since the cake will still be cold from having been in the freezer, your buttercream or whipped ganache should adhere well to the surface. Spread the filling to within 1-2 cm of the edges. For this cake, I spread a thin layer of whipped ganache, then a slightly thicker layer of buttercream. You could also use jam, mousse and/or nestle fruit in a layer. 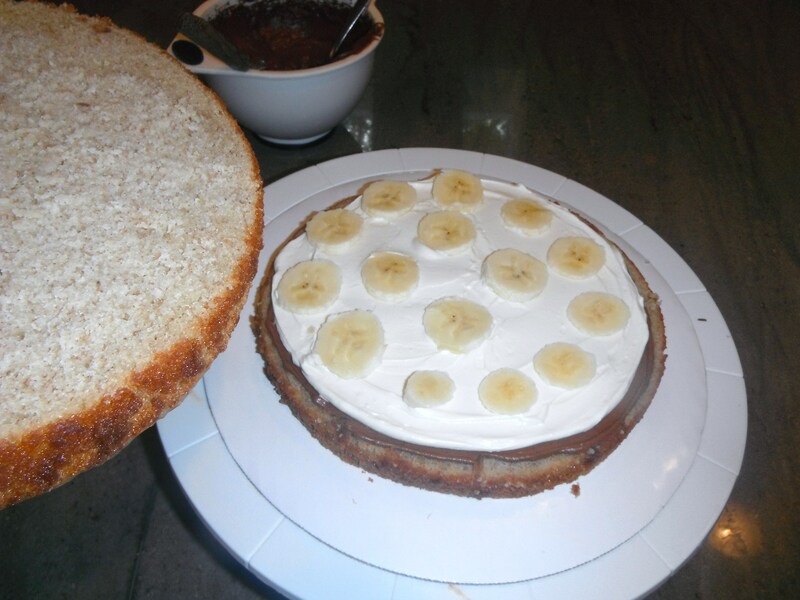 For the banana blitz, I put some thinly-sliced bananas in the buttercream layer. Once you have your fillings in, lay the second half of your first layer on top, adjusting where you place it based on any height inconsistencies at this point. 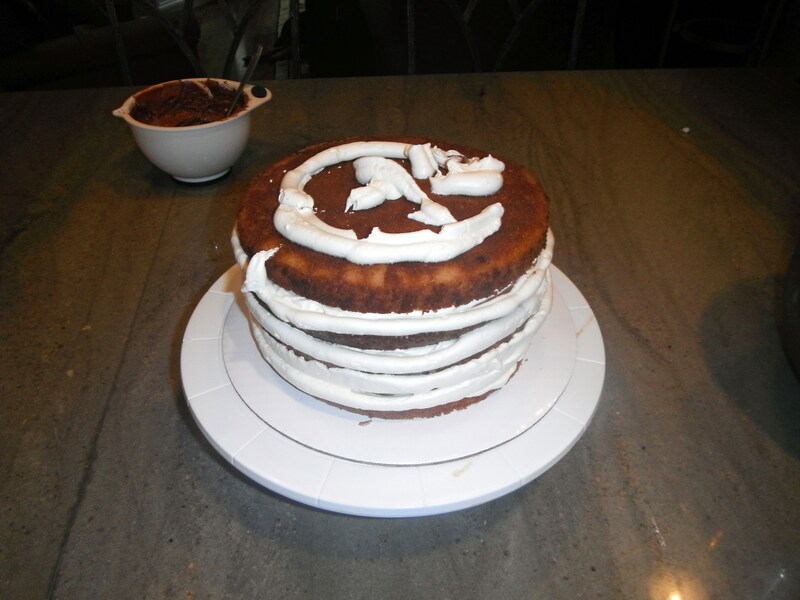 (Position the thicker side of the layer on whatever side of the cake is lower at this point, if applicable.) Crouching so the cake is at eye level, use your hand to level the cake, pressing down on any areas that are slightly higher. Peel off the parchment. Add your fillings to the top of this layer in the same way. Cut the second full cake layer in half using the same technique and invert then fill as with the other two. Be sure to peel the parchment from the bottom of the layer. 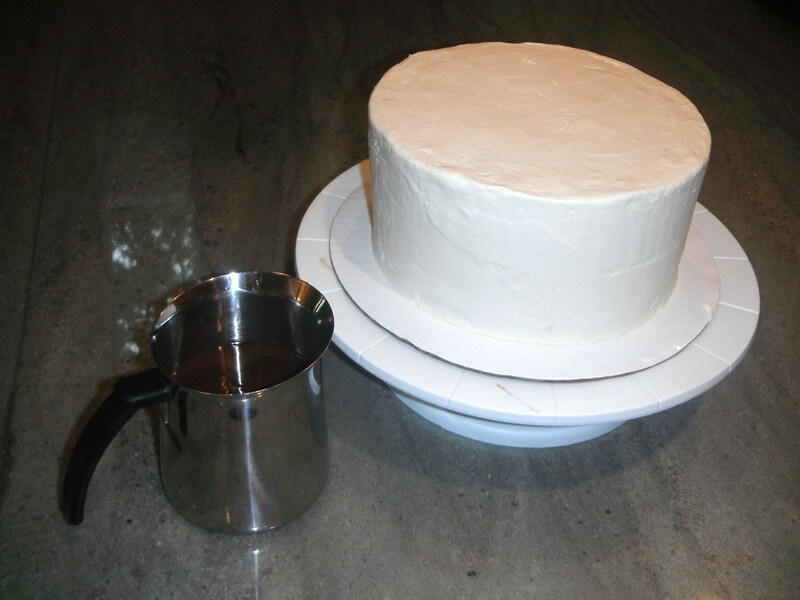 The assembled cake can be placed in the freezer for 20 minutes or so in order to make it easier to ice. Use buttercream in a decorating bag and pipe the icing all around the sides and in a circular pattern on top. (It is not necessary to be neat at this point, you just want to make sure you are covering the cake.) Use a spatula to smooth the sides and top, keeping the spatula blade clean in between spreading and smoothing. The cake can go back into the freezer for 20 minutes more prior to putting on a final coat or a ganache drizzle. 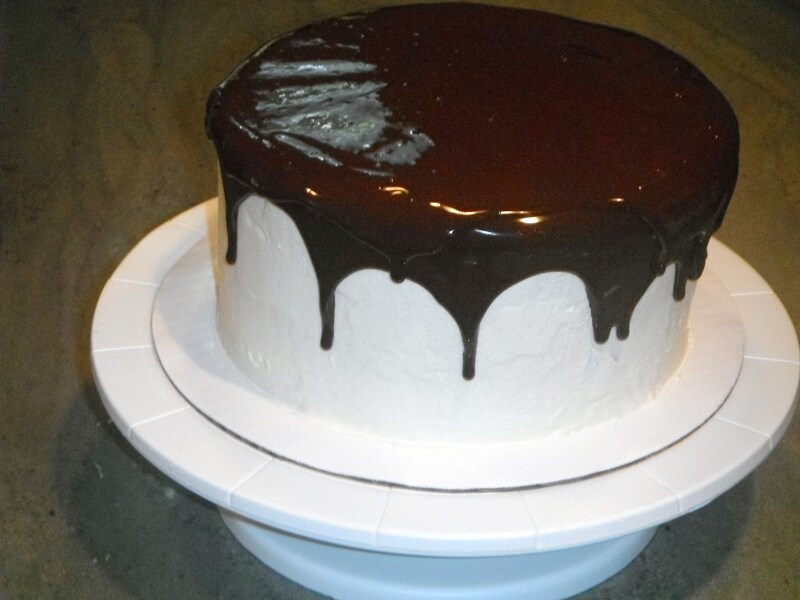 To complete the ganache drizzle, put about 12 ounces of liquid ganache (temp should be neutral to the touch-too hot and it will melt the icing from your cake and too cool it will be too thick to pour) in a small bowl or cup with pouring spout. Start in the center of the cake and keep pouring until the ganache drizzles lightly down the sides, pipe a border, decorate the top as you prefer. Those desserts look too good!!! Making me hungry! I have always seen that bakers freeze the cake before and during frosting but I have always wondered that what happens after you finish frosting. I mean doesn't the cake taste frozen as in a little hard with ice crystals? Or if you store it in the refrigerator after frosting, doesn't the cake give out some water on thawing and spoil the frosting? I hope I didn't sound very confusing. Would really appreciate your reply as I am very new to frosting.